The impact of shale oil, otherwise known as tight oil or light-tight oil (LTO), in the United States is indisputable. Aggregate production (conventional and non-conventional) is now almost level with its 1970 peak (click for larger image) with shale leading the oil rennaisance. 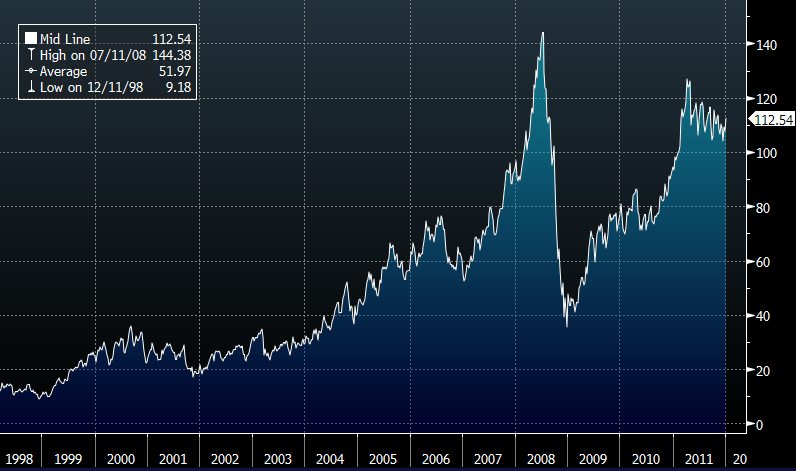 How long will it take for production to adjust if crude stays around $50 per barrel? As I’ve mentioned before, shale is an industry with high upfront costs but relatively low operating and maintenance costs. 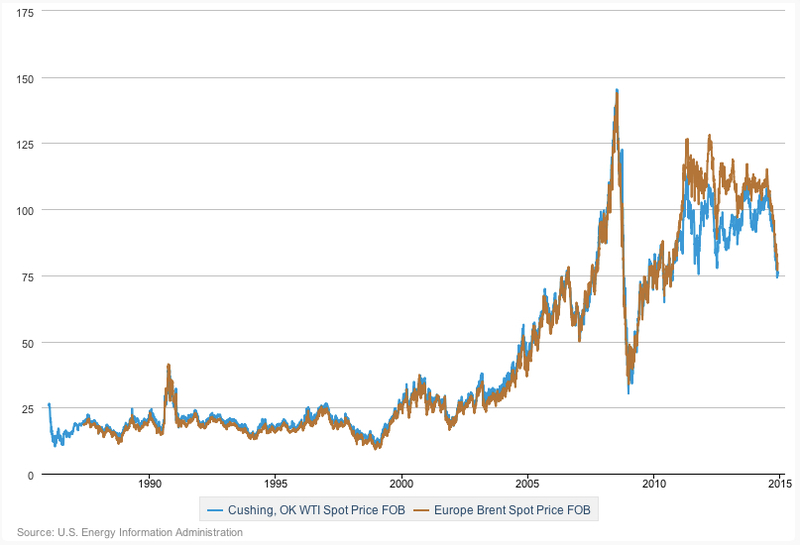 The upfront costs are already ‘sunk’, so the ‘pump’ or ‘don’t pump’ break-even point is as low as $10-20 per barrel. Moreover, many producers hedge to varying degrees. 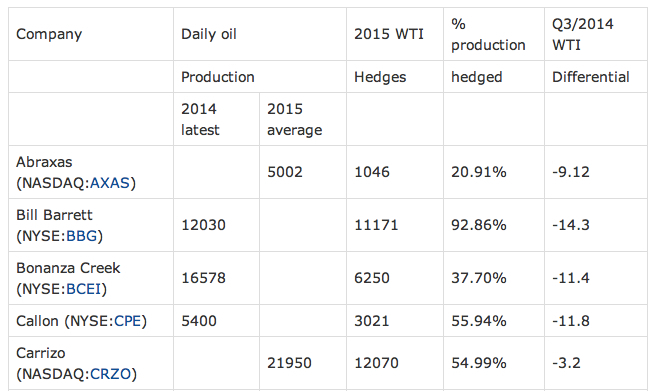 To get a taste of this, here is part of a table on listed shale oil producers published at Seeking Alpha. Once these hedges roll off, profit margins will collapse. Meanwhile, the output of shale wells declines by around 60% in the first year; therefore, sustained production requires continuous new investment. And new investment requires a decent return on investment. Reuters has a good article by John Kemp on how this dynamic works. Bloomberg New Energy Finance estimates that to sustain current levels of shale oil production would require a return on investment of 10%, but to increase production would need a 20% return (see their White Paper here). 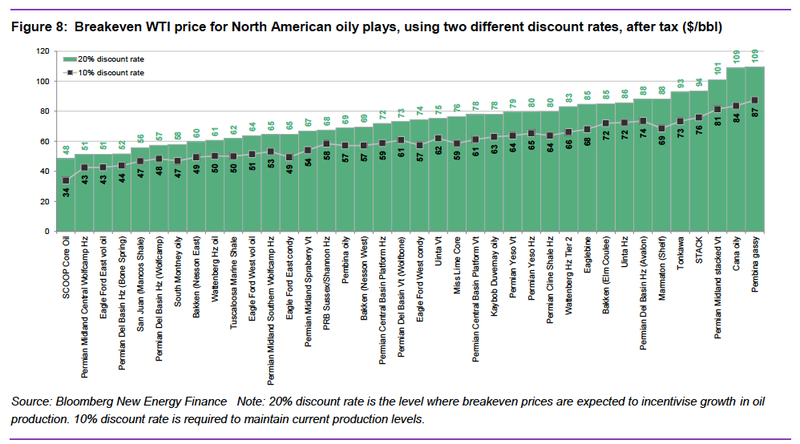 Using these rates, they then go on to look at what oil price is required for each region to get such returns (click for larger image). Based on these calculations, the US oil industry will fall off a cliff should the oil price remain below $50 for more than a year. 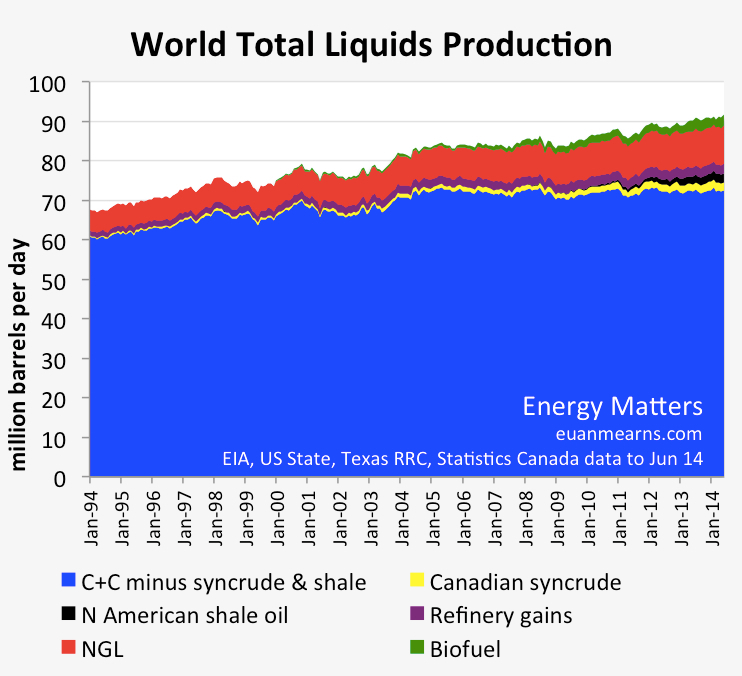 Bottom line: shale oil has not killed peak oil, but cheap oil will kill shale. The only way this won’t happen is if the oil price moves back up again–which I forecast it will. As Colin Campbell and Jean Laherrere said in a prophetic 1998 article in Scientific American, “The world is not running out of oil–at least not yet. What our society does face, and soon, is the end of abundant and cheap oil on which all industrial nations depend.” As I said yesterday for natural gas, to prove Campbell and Laherrere wrong we need to see low oil prices and rising production–not one without the other. It’s a simple test. Let’s see what happens. This is my second post on the National Intelligence Council (NIC) briefing for the U.S. president called “Global Trends“, a report that looks at potential risks to the United States 20 years ahead. The first post (here) dealt with climate change, but in this post I want to take a look at how the Intelligence Community views the potential threat of a future energy constraint on the U.S. and world economy. The quick answer: not much of a threat at all. In a likely tectonic shift, the United States could become energy-independent. The US has regained its position as the world’s largest natural gas producer and expanded the life of its reserves from 30 to 100 years due to hydraulic fracturing technology. 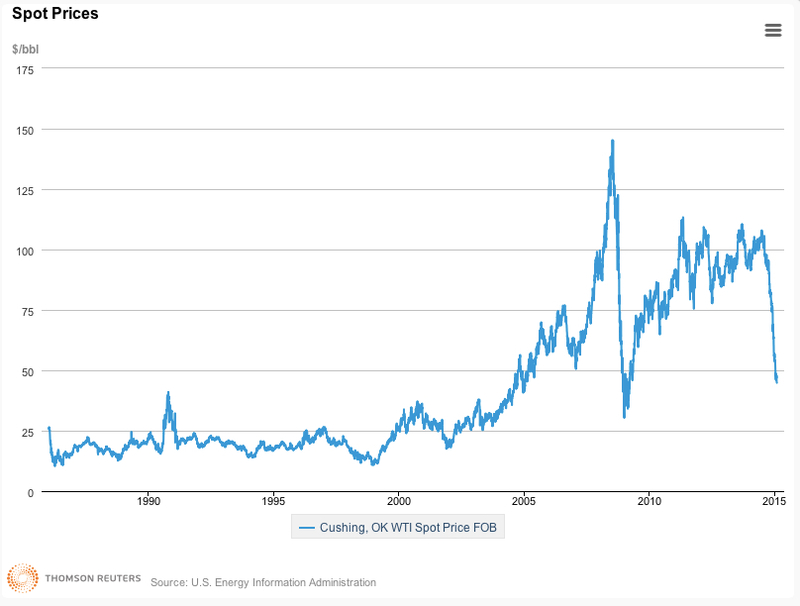 Taking a short interlude from my recent treatments of technology, I feel the need to do a quick post on Peak Oil’s continued transformation toward respectability. 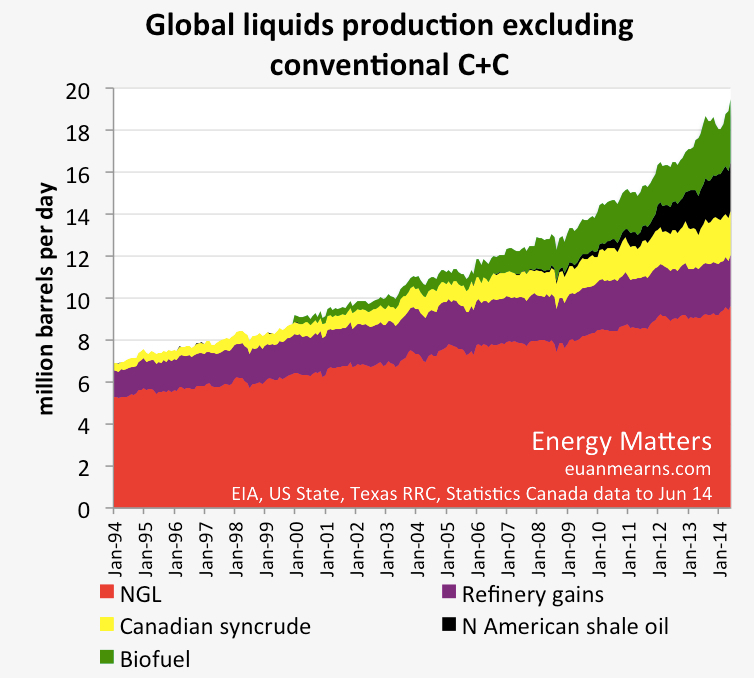 Some months ago, I highlighted the fact that the IMF had openly recognised the Peak Oil argument in even its most prestigious publication, the World Economic Outlook (see my post here). In particular, IMF staffers now appear to be thoroughly acquainted with the work of Steve Sorrell, who has provided us with some of the most in-depth reviews of the Peak Oil literature (see my post here). Now here’s a task for you. Click on the link here to Economist’s View, probably the most widely visited economics blog and aggregator of all things economics-related on the web. 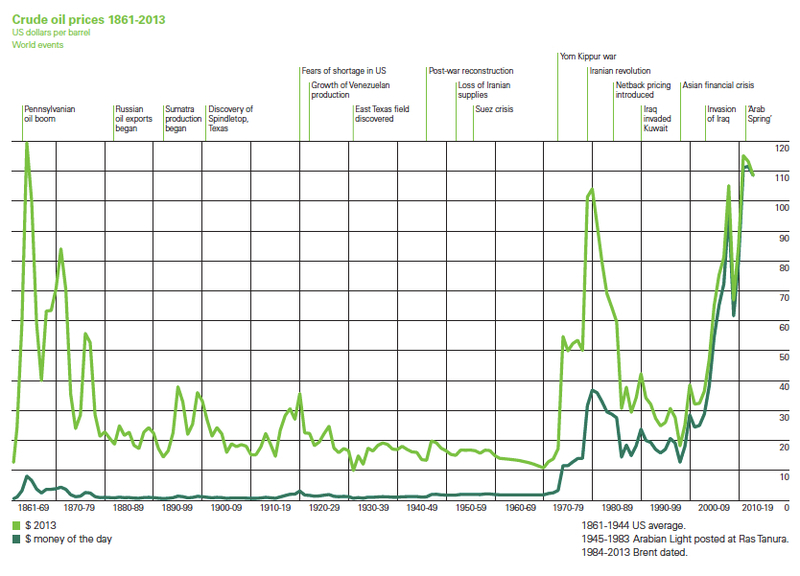 Go to the Google Search function at the top and type in ‘Peak Oil’ restricting the search to ‘This Site’. What do you get? The answer: very little (relatively speaking). Around 98o results, compared with a total of 9,500 for the word ‘Greece’. I don’t care when oil (OR COAL) peaks, I care when we run out, which we won’t because, as production declines, prices WILL rise. As prices rise, people WILL figure out alternatives. They might not be happy alternatives. They might not be as productive alternatives. They might not support the same lifestyle to which we are accustomed. But there WILL be alternatives, forced by higher prices–and no other mechanism is that powerful. The world is not running out of oil – at least not yet. What our society does face, and soon, is the end of the abundant and cheap oil on which all industrial nations depend. From an economic perspective, when the world runs completely out of oil is thus not directly relevant: what matters is when production begins to taper off. Beyond that point, prices will rise unless demand declines commensurately. Thus from a theoretical standpoint, there is in reality not much difference between Campbell and Laherrere, on the one hand, and Haab on the other. And now a plea from me: could everyone please keep their straw men in the barn. If we only seek out the views within the opposing camp of the extremists, or the outdated, it is relatively easy to knock down their arguments—but it doesn’t further the debate. 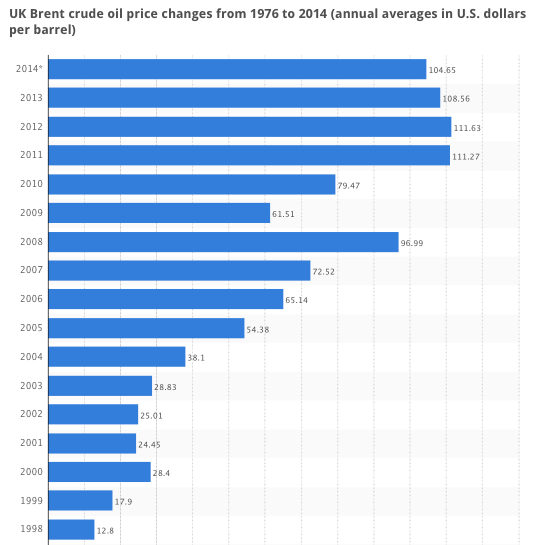 Few Peak Oilers now say that one day there will be oil and the next it will be gone; most prescribe, like Campbell and Laherrere, to the idea of peak ‘cheap’ oil and the theory that an oil production growth constraint could increasingly impact on wider economic growth and human welfare. More broadly, I mentioned in my last post that Peak Oil theory would need to overturn the neoclassical economics consensus. Actually, this claim needs refining somewhat, since I wasn’t referring to the theory of neoclassical economics but rather the empirical world view of most neoclassical economists. Mark that these are two very different concepts. Advocates of a biophysical economic view of the world do look at the world differently (look at the graphic below from Question Everything). However, I would argue that the viewpoints are not contradictory; rather they are more like very different artistic interpretations of the same object: the earth system. The critical point here is that biophysical approaches to economics warn of the tyranny of the second law of thermodynamics: energy and matter will tend to entropy (disorder). From a neoclassical perspective, this, translates into increased scarcity and an upwardly sloping supply curve that moves continually to the left. This contrasts starkly with the neoclassical cornucopian paradigm that as technology advances the supply curve moves inexorably to the right. Put bluntly, the peak resource advocates see stuff getting progressively more scarce and thus more expensive; traditional neoclassical economists see stuff getting ever more accessible (through the magic of technology) and thus cheaper. And so back to oil. A strong proponent of the magic of markets and technology over the years has been Daniel Yergin the cofounder of Cambridge Energy Research Associates and the author of a number of highly influential books on the oil industry, the most recent of which—”The Quest”—was a mainstay of my Christmas reading. If you don’t want to read the book, then I recommend an Op-Ed piece he wrote for the Wall Street Journal here. Hubbert insisted that price didn’t matter. Economics—the forces of supply and demand—were, he maintained, irrelevant to the finite physical cache of oil in the earth. But why would price—with all the messages that it sends to people about allocating resources and developing new technologies—apply in so many other realms but not in oil and gas production? Activity goes up when prices go up; activity goes down when prices go down. Higher prices stimulate innovation and encourage people to figure out ingenious new ways to increase supply. Hubbert is certainly a towering figure in the Peak Oil movement, and Campbell and Leherrere likely built on his intellectual foundations. But schools of thought (at least good ones) evolve, and it is no different with the advocates of peak oil. Thus, if one is to criticise Campbell, it cannot be because he ignores price (even though M. King Hubbert certainly held the market system in little esteem). A second common rejoinder is that new technologies have steadily increased the fraction of oil that can be recovered from fields in a basin—the so-called recovery factor. 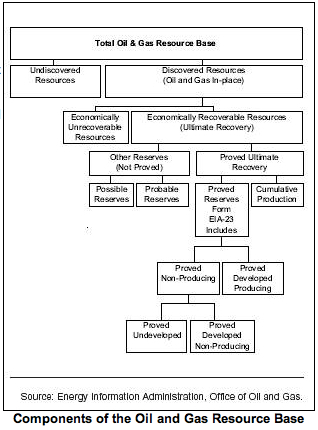 In the 1960s oil companies assumed as a rule of thumb that only 30 percent of the oil in a field was typically recoverable; now they bank on an average of 40 or 50 percent. That progress will continue and will extend global reserves for many years to come, the argument runs. Theoretically, these unconventional oil reserves could quench the world’s thirst for liquid fuels as conventional oil passes its prime. But the industry will be hard-pressed for the time and money needed to ramp up production of unconventional oil quickly enough. If advanced methods of producing liquid fuels from natural gas can be made profitable and scaled up quickly, gas could become the next source of transportation fuel. At this point, let me have a little rant of my own echoing that of of Professor Haab who kicked off this post. 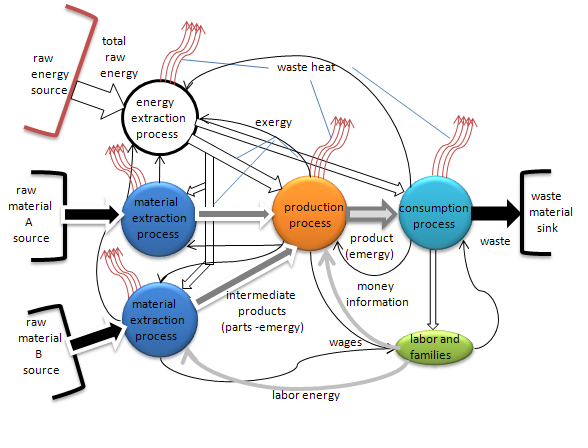 Peak Oil thought does not automatically contradict the underlying philosophy of market economics. Most of it can be encompassed in the idea that the oil supply curve is inelastic over the short term and will tend to move to the left over the long term as resources run dry, thus leading to permanently high prices. 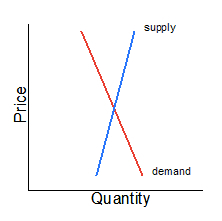 Put differently, the argument is not one of whether supply and demand curves exist, but rather what shape they are and how they move through time. The market speaks—and it is stunning reaffirmation of Campbell and Laharrere. Yergin’s book “The Quest” is a paean to technology: data processing on an unheard of scale, horizontal drilling, CAD/CAM oil field design, deep water drilling, new technology to extract oil from tar sands and shale—the list goes on. In other words, the modern world oil industry is a tribute to science, as well as man’s endeavour unleashed by free markets. Yet over that period the oil price has risen tenfold in nominal terms and over fivefold in real, inflation-adjusted terms. And here is the supply response (taken from the BP Statistical Review). Lacklustre at best. In short, when the market price of an item rises, it should cause people to substitute away from the good and cause more investment in the production of the good: this is Economics 101. 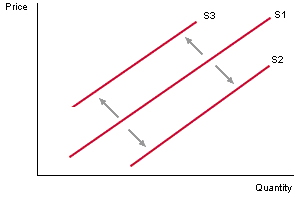 Taken together, the market should produce countervailing forces that ameliorate the rise. Over the last decade, this has not been happening. 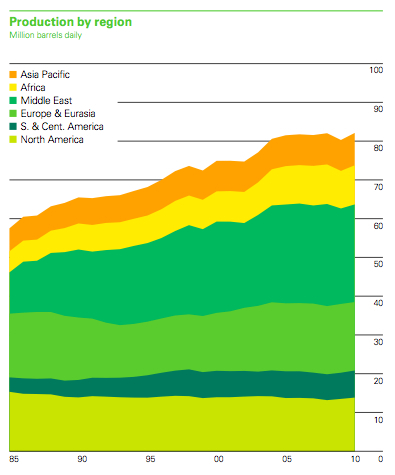 Mr Market has spoken, and it has been on the side of Peak Oil. It would be nice, therefore, if Economist’s View could give the issue a little more respect—despite the undoubted importance of Greece.